Trinh, T.N.G, Schellart, P, Buitink, S, Corstanje, A, Enriquez, J.E, Falcke, H, … Rutjes, C. (2015). 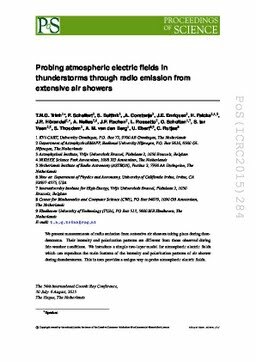 Probing atmospheric electric fields in thunderstorms through radio emission from extensive air showers. In Proceedings of International Cosmis Ray Conference 2015 (ICR 34) (pp. 1–8).